2018 Bobby Pierce #32 Dirt Late Model diecast, by ADC American Diecast Company. The Bobby Pierce Racing #32 dirt late model was raced by Bobby Pierce "Smooth Operator" during the 2018 Dirt Late Model season. 2017 Bobby Pierce #32 The Joker / World 100 / Dirt Late Model diecast, by ADC American Diecast Company. Bobby Pierce "Smooth Operator" raced this #32 The Joker dirt late model in the 47th Annual World 100 at Eldora Speedway. 2017 Bobby Pierce #32 Allgayer / Dream / Dirt Late Model diecast, by ADC American Diecast Company. Bobby Pierce "Smooth Operator" raced this #32 Allgayer Dream dirt late model in the 23rd Annual Dirt Late Model Dream at Eldora Speedway. 2016 Bobby Pierce #32 Allgayer / Dirt Late Model diecast, by ADC American Diecast Company. 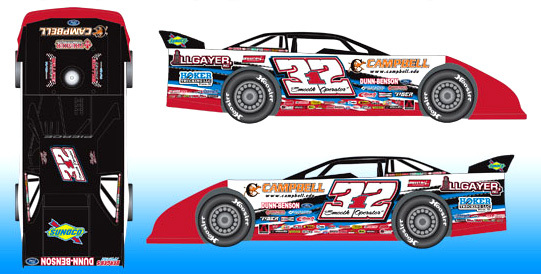 The Bobby Pierce Racing #32 Allgayer Inc. dirt late model was raced by Bobby Pierce the "Smooth Operator" in select events during the 2016 Dirt Late Model season.